NEW YORK — Three MLB stars, Greg Maddux, Tom Glavine & Frank Thomas, were elected to the Cooperstown Baseball Hall of Fame, Wednesday January 8, on their first ballot debut. Greg Maddux and Tom Glavine will join their former Atlanta Braves manager, Bobby Cox, at the July 27 induction along with Joe Torre and Tony La Russa, also elected last month. MLB players, Greg Maddux, Tom Glavine & Frank Thomas, who were elected to the Cooperstown Baseball Hall of Fame on January 8, 2014. Those whose reputations were tainted with steriod use including Barry Bonds & Roger Clemens, needed 75 percent to be elected. Instead they dropped below 40 percent in their second appearance. Clemens dropped from 37.6 percent to 35.4 in voting by senior members of the Baseball Writers’ Association of America, Bonds from 36.2 to 34.7. 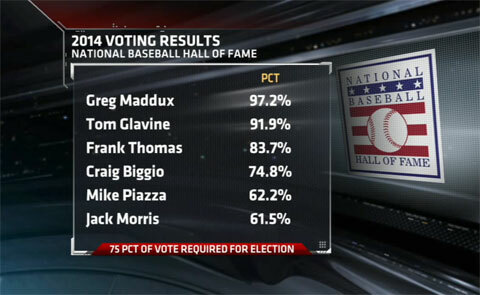 Photo shows the 2014 Baseball Hall of Fame voting results. Watch the following Fox Sports video where Jon Morosi speaks about the 2014 Hall of Fame class that includes Frank Thomas, Tom Glavine and Greg Maddux. Greg Maddux and Tom Glavine become the first primarily starting pitchers to enter the Hall of Fame whose careers began after Bert Blyleven, who debuted in 1970. Maddux reached the major leagues in 1986 and Glavine a year later. Frank Thomas, a designated hitter and first baseman, became one of baseball’s biggest stars in the 1990s. Playing Field Promotions is a booking agent for motivational sports speakers and celebrities. If you would like to book baseball speakers or MLB stars like Greg Maddux, Tom Glavine or Frank Thomas for a speaking engagement, guest appearance or charity fundraiser, you can contact our booking agent for appearance and speaker fees or call 1.800.966.1380.